The bus lines mainly follow the central east-west axis of Ulaanbaatar and the inner and outer ring roads (baga toïrog, ix toïrog). Other lines connect the various suburbs in the north and east with major traffic junction points downtown of which the National Normal University (UBIS -- Ulsyn Bagshiïn Ix Surguul', also known as Pedagogical Institute UBDS -- Ulsyn Bagshiïn Dääd Surguul' --- near the Ulaanbaatar Hotel) are important for commuters going north, and the Officers' Palace (Officeruudyn Ordon) in the east (near the Ministry of Defense) is important for commuters travelling to Shar Xad and Amgalan. 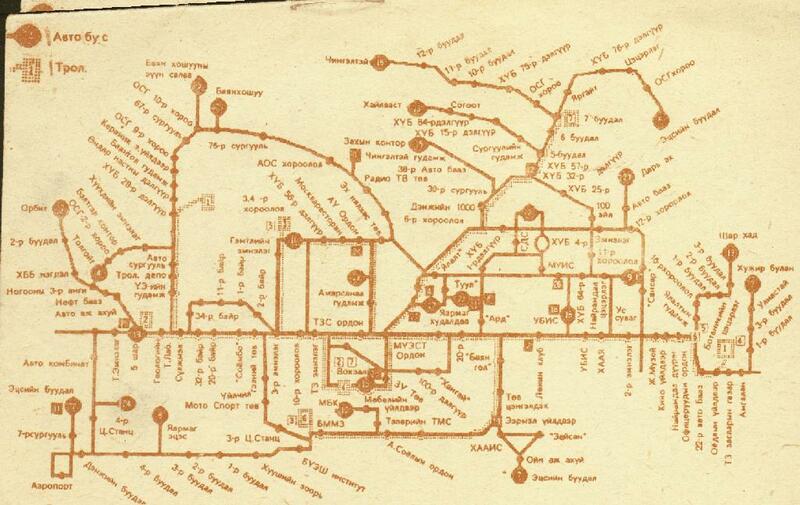 A bus map of Ulaanbaatar. Trolley bus line 8 is not yet indicated. In the square in front of the Museum of Fine Arts people gather early in the mornings in order to get on the overland busses going many hundreds of kilometers into the country side, like to Xar Xorin (Kara Korum) etc. Most of the bus lines are given in the following table. It cannot be garuanteed that this information is correct; at least one trolley bus line is known which was added after 1993 (line T8).